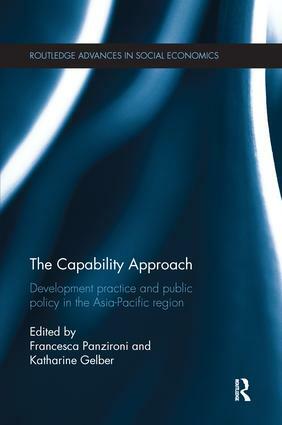 This book provides a unique laboratory of ‘capabilities in practice’ in the Asia-Pacific region. It explores the application of the capability approach in development practice and public policy from a multidisciplinary perspective by bringing together scholars and practitioners from a wide range of disciplinary backgrounds, including development studies, health policy, political science, political theory, political economy, architecture, indigenous studies, urban planning and communication technologies. The first part of the book provides a foundational theoretical framework to introduce the empirical applications of the capability theory in different areas of development practice and public policy in the Asia-Pacific region. This part discusses thorny issues in capability theory and raises the potential for capability theory to lead to new ways of thinking about old problems. The second part discusses the application of the capability approach to intransigent problems of marginalisation and the articulation of public policy in New Zealand and Australia. In particular, this part focuses on the potential implications that a capability-based approach can have on the well-being of indigenous peoples in both countries, as well as children, older renters, and urban dwellers in Australia. The third part elucidates how capability theory is being applied by researchers in the Asia-Pacific region to local issues in developing countries such as Samoa, Vanuatu, Papua New Guinea and Sri Lanka. In doing so, it provides original content to the world market in capability theory by focussing on this often-neglected area of scholarship. As a whole, this volume offers a unique and innovative scrutiny of a multifaceted capability-based analysis of development practice and public policy. The scope and breadth of this volume advance the application of the capability approach and offer an indispensable resource to scholars, researchers, policy makers and policy practitioners interested in the theoretical insights and practical implications of the capability approach. Francesca Panzironi is Lecturer in Development Studies in the School of Social Sciences at the University of New South Wales, Australia. Katharine Gelber is Associate Professor in the School of Political Science and International Studies at the University of Queensland, Australia.